All groups are vulnerable to failure but dysfunction comes in different ways and often invisibly. One group starts, sputters, and stalls for no observable reason. Another is hijacked by one or two dominators asserting power and influence. Others never rise to the challenge. They suffer from a lack of resources, uninspired leadership, sloppy organization, or an avoidance of responsibility. Sometimes, though, a powerful amalgamation of talent, energy, urgency, and dynamic leadership congeals and a group becomes great. The date is October 15, 1962. The Cold War era between Russia and the U.S. is reaching a climax. Routine reconnaissance photos taken from an American U-2 spy plane over Cuba reveal Soviet surface-to-surface medium-range ballistic missiles and a launching facility under construction in a sugar cane field. President John F. Kennedy, two years into his presidency, is alerted and the next morning he calls his closest advisers to the White House. He shows them the photos, explains the international and domestic delicacy of the situation, and appoints a special Executive Committee of the National Security Council to wrestle out the issues, the validity and meaning of information, and the potential and often-shifting policy choices. 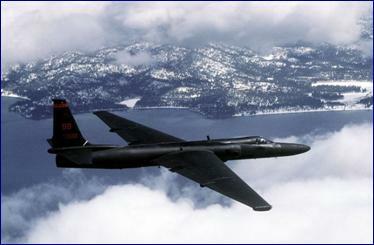 An Air Force U-2, Similar to those Conducting Cuban Over Flights During the Cuban Missile Crisis. Credit: Wikimedia Commons. The Committee, called â€œEx-Comm,â€� is made up of twelve of Kennedyâ€™s closest and brightest advisers. They are a diverse assembly that includes, among others, Secretary of Defense Robert McNamara; U.N. Ambassador Adlai Stevenson; Robert Kennedy, the Presidentâ€™s brother and attorney general; Vice President Lyndon Johnson; and Maxwell Taylor, Chairman of the Joint Chiefs of Staff. The President instructs Ex-Comm to meet with the utmost secrecy and to give him a recommendation for a single response to the rapidly unfolding crisis. If agreement cannot be reached, he asks for proposed alternative courses for action. Ideas percolate. Maxwell Taylor and the Joint Chiefs of Staff advocate for immediate preemptive military strikes, recognizing that such actions could precipitate retaliatory attacks, possibly nuclear, against the U.S. and its allies in Europe. Adlai Stevenson and several others want to pursue a diplomatic course. Robert McNamara likes the idea of a blockade of Russian ships. The Presidentâ€™s closest and most trusted advisers in the group are his brother, Robert, and Ted Sorenson, his speech writer and political adviser. The two become Kennedyâ€™s â€œeyes and earsâ€� inside Ex-Comm and get together regularly before and after Ex-Comm meetings. Inside Ex-Comm itself the debate is fierce and shifts repeatedly in response to the daily events that are cascading around them. On October 22, Kennedy goes public to the American people. He demands that the Soviets withdraw their missiles, orders a quarantine of Soviet shipments to Cuba, places U.S. forces on full alert, and warns the Soviet Union of full force reprisals to any missile launch. Two days later, Soviet Prime Minister Nikita Khrushchev replies. He puts the Soviet military on high alert and threatens to sink any U.S. ships that interfere with Russian ships heading to Cuba. President Kennedy and members of the Ex-Comm. Credit: Wikimedia Commons. The Ex-Commâ€™s steady stream of advice to President Kennedy is crucial. Kennedy wants several things from them. First, he does not want a repeat of the Bay of Pigs fiasco 18 months prior. He makes it clear that his preference is to avoid armed conflict if possible, but does not rule out a military response. Second, he wants open and strong debate between the hawks and doves, insight into the thinking behind the Soviet maneuvers, and strategic short and long-term advice as he begins to negotiate with Khrushchev. Most of all, he wants a hedge against possible backsliding, distancing, and second-guessing should things go wrong. He wants all of his people behind him with no defections. On October 25th six Russian ships heading for Cuba with weapons are stopped at the American quarantine line. Aided by photographic exposure of the Cuban missiles at the United Nations and various back channel diplomatic efforts, Kennedy agrees to retire obsolete U.S. missiles poised against Russia in Turkey. Khrushchev agrees to stand down from Cuba. The crisis ends. 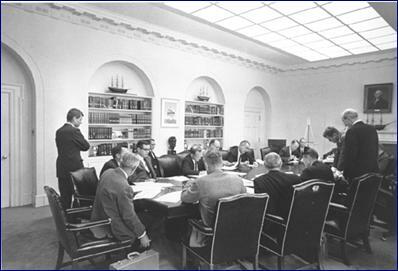 Of the Ex-Comm, Robert Kennedy would later write: â€œThey were men of the highest intelligence, industriousness, courageous and dedicated to their countryâ€™s highest well-being.â€�[i] Wrestling with imperfect and sometimes erroneous information, they argued over political vs. military strategies and squarely confronted the risk of creating the worldâ€™s first nuclear war. Major John Reisman: â€œShoot any officers you see in there.â€� Victor R. Franko: â€œWho? Ours or theirs?â€� From the 1967 film The Dirty Dozen. 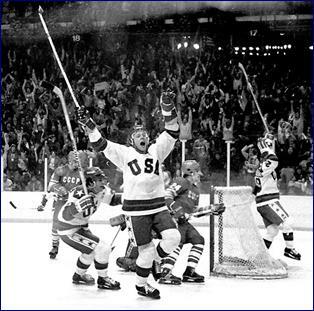 Miracle on Ice â€“Herb Brooksâ€™ 1980 U.S. Olympic Hockey Team. Credit: Wikimedia Commons. If you were putting together the perfect coalition, the perfect partnership, the perfect committee, commission, working group or team needed to tackle a thorny issue, you might be inclined to go for the best in the field: an A-team made up of the brightest, biggest, toughest, and most accomplished. Thatâ€™s the conventional thinking, but history says you would be making a mistake. Al Davis of the Oakland Raiders put together his best teams with mavericks, misfits, and cast-offs. Coach Herb Brooks, who took the American hockey team to a stunning Olympic upset over the Russians in 1980, looked for the second-best players who were hungry. The egos that go along with dream teams overshadow the work to be done. Working together -- â€œteamworkâ€� -- is actually an individual skill. It can be cultivated but not if everyone insists that they have no need for the others in the room.